This proved to be the hit of the holiday, surprisingly enough. 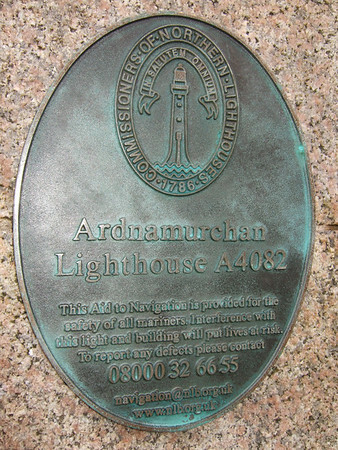 Predictably we had been keen to go and see it in the first place, it being the most westerly point on the mainland, but it turned out to offer a combination of attractions that fitted right into our relaxation schedule, as it were. Wonderful vistas out to sea, encouraging lengthy, fruitless but enjoyable periods of attempted whale/dolphin/shark spotting. (We did see a seal one of the days though). It was also an interesting place in it's own right, and they've put a lot of work into the exhibit and the surrounding area, with picnic benches, wee walks laid out and so on. It's dog-safe (as long as you keep half an eye out for them in the car park) which means they can get a good runout off the lead; in truth a real boon as much of Ardnamurchan is sheep heavy. There's a tearoom, so you can get a nice coffee to warm you up after exposure to the brisk southwesterlies. 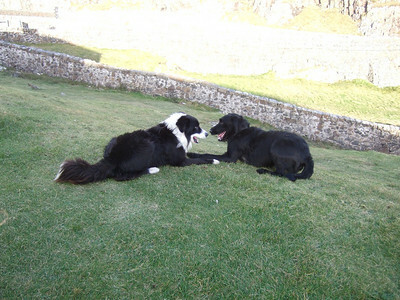 And last but certainly not least, the chap that looks after the place has a rather fetching border collie called Finn. 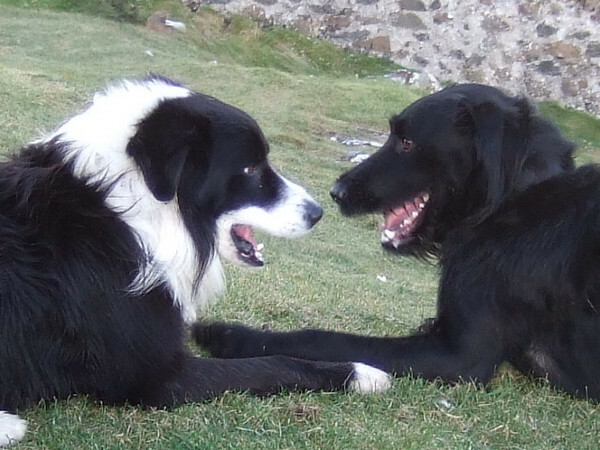 And our Wee Black Dug was awfy taken with his Wee Black and White Dug. Who would have thought such a remote spot would have been the scene of a holiday romance? Molly was spitting feathers. As the tall blonde glamorous one, it's usually her that pulls. For the sceptics, I offer two photies - or rather one photie, two versions. In this first one, you can see that Jorja and Finn are playing like dugs do. Fine. But check out the zoomed version. They're staring deep into each other's eyes...and smiling.